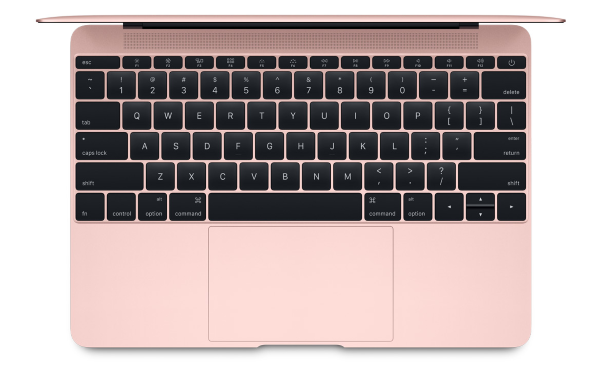 Apple Inc. revealed the newest iteration of its MacBook line today, adding a range of upgrades including the latest Intel processors, improved graphics card performance, faster flash storage, an additional hour of battery life, and a fourth colour that users can choose for the product’s aluminum finish – rose gold. Touted by Apple as the company’s thinnest, lightest notebook yet, the updated MacBook features a 12-inch display, full-sized keyboard, and all-day battery life, in a device that weighs only two pounds and is only 13.1 mm thick. Powered by sixth-generation dual-core Intel Core M processors, with turbo boost speeds of up to 3.1 GHz, and a new Intel HD Graphics 515 card that performs up to 25 per cent faster than the previous MacBook generation, it’s also a powerful computer in its own right. Also like the line’s previous generation, it remains cool enough to not require a fan. Another feature that users might want to make note of is the MacBook’s reliance on a USB-C port, which allows for charging, data transfer, and video output in a single connector, but is also one-third the size of a traditional USB, though you can purchase accessories such as the (poorly reviewed) USB-C Digital AV Multiport Adapter, which includes HDMI and standard USB ports, to address this concern. The device is also wireless ready, with built-in 802.11ac Wi-Fi and Bluetooth 4.0 hardware, and like all Apple computing products, comes with (the well-reviewed) OS X El Capitan, artist-friendly software including iMovie and GarageBand, and the iWork suite. The new MacBook is available through Apple’s website starting today, and in the company’s retail stores starting tomorrow at a price ranging from $1,549 to $1,899 depending on the processor and amount of memory chosen.